Will Philippine presidential yacht Pag-Asa be sold? Pag-Asa, the Philippine presidential yacht, could be sold off according to incoming president Rodrigo Duterte. The 77 metre yacht has a long and colourful history, but Mr Duterte hopes to find a new owner and raise funds for war veterans, hospital facilities, and improving doctors' salaries to stop them from emigrating. Upkeep of the presidential yacht currently costs the Philippine government 32 million pesos (roughly £450,000) per year, according to CNN Philippines. However, finding a buyer may not be straightforward, as one of Mr Duterte’s predecessors unsuccessfully tried to sell off Pag-Asa in 1986, with an asking price of $5,500,000. Built in 1958 by Japanese yard Ishikawajima-Harima Heavy Industries, Pag-Asa was given to the Philippine navy as part of the post-war reparations. 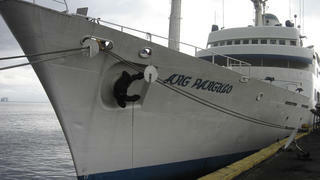 More than 50 years after its launch, Pag-Asa still ranks as one of the top 200 largest yachts in the world. Originally named Lapu-Lapu after a 16th century war hero who defeated Ferdinand Magellan, she served as the flagship of the Philippine fleet for two years before being refitted as a yacht and renamed Roxas in 1962. Ferdinand Marcos was particularly fond of the presidential yacht — in 1967 he renamed it Ang Pangulo, which means ‘the president’ in Filipino. The controversial ruler hosted many famous faces aboard his yacht, from ballet dancers Margot Fonteyn and Rudolf Nureyev to actress Brooke Shields. The final stage in her transformation came in 2006, when a fire on board led to a refit and the most recent renaming. However, with incoming president Duterte keen to distance himself from the excesses of his predecessors, it seems that this venerable old yacht will be looking for a new home.